Description: This is a little known species, which has usually been considered synonymous with Doto coronata. 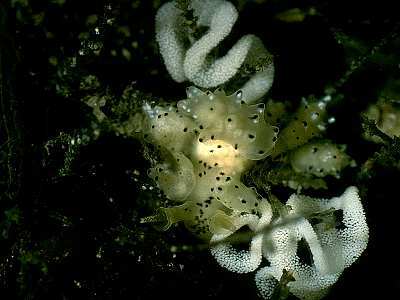 It was believed by Lemche (1985) to be the species found on the calyptoblastic hydroid Dynamena pumila which grows intertidally on Fucus serratus and other brown algae. Further investigations are needed to confirm or refute this conclusion. The animal shown here is only tentatively identified with this species. Picton, B.E. & Morrow, C.C. (2016). Doto onusta Hesse, 1872. [In] Encyclopedia of Marine Life of Britain and Ireland.